The unexplored Antarctic is one of the most exciting places to visit on earth. The Antarctic is also the last place we expected to be after operating a tropical dive centre for 23 years. 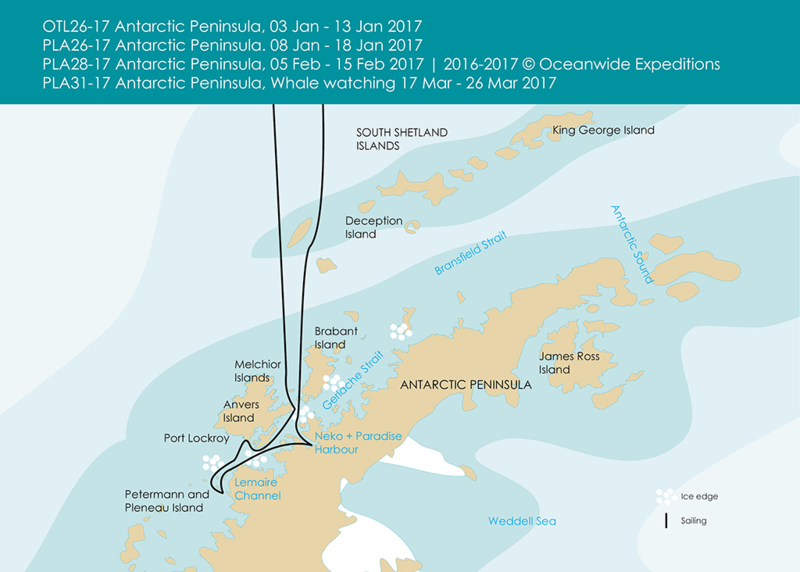 But chance led to a meeting, and the meeting led to our first Antarctic Expedition of 2017. Since this time, we have offered the full array of Antarctic Tours and Holidays, through what we perceive to be the best Antarctic Expedition company, Oceanwide Expeditions. Every two years, we offer a guided Antarctic Dive expedition. We are the only company in the UK who offers guided Antarctic dive expeditions, but we also offer the full array of Antarctic Tours that can be done at any time during the Antarctic spring summer and later summer months. Divers and non-divers alike are welcome on all our Antarctic holidays. 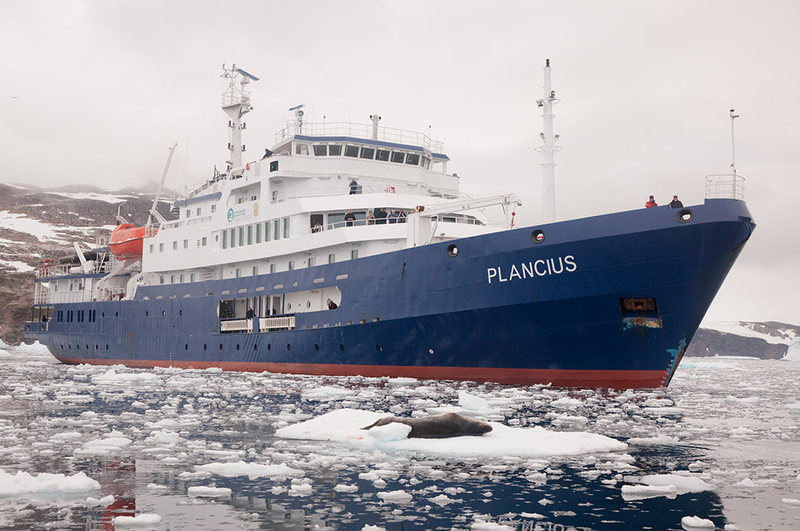 All of our Antarctic Cruises take place on the MV Ortelius, the MV Plancius and soon the MV Honduis. These vessels are specialised Antarctic expedition vessels. The MV Ortelius is a polish built, former Russian “research” (spy) ship, that was bought by Oceanwide and totally refurbished. 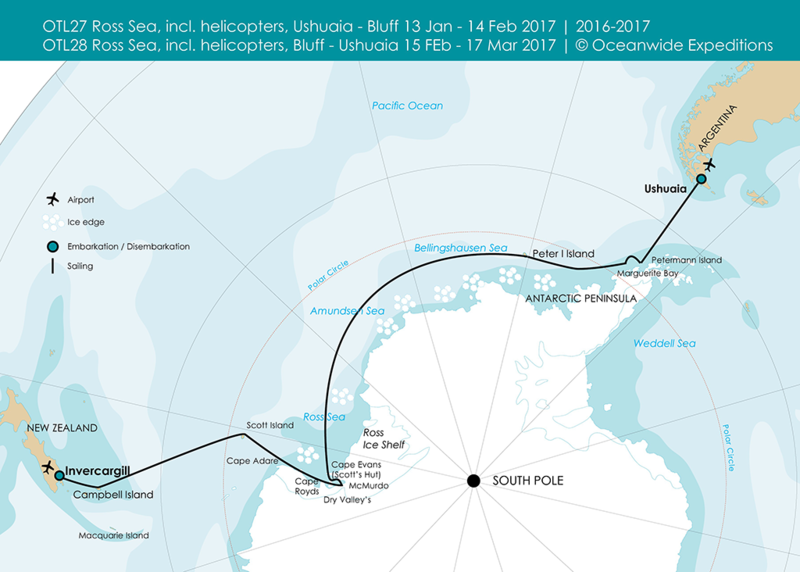 The Ortelius has the toughest ice strengthened hull that allows it to penetrate deeper into the Antarctic than any other Antarctic cruise vessel apart from Ice Breakers. The MV Ortelius is like a land rover, small, comfortable enough but does the job that few other ships can do. 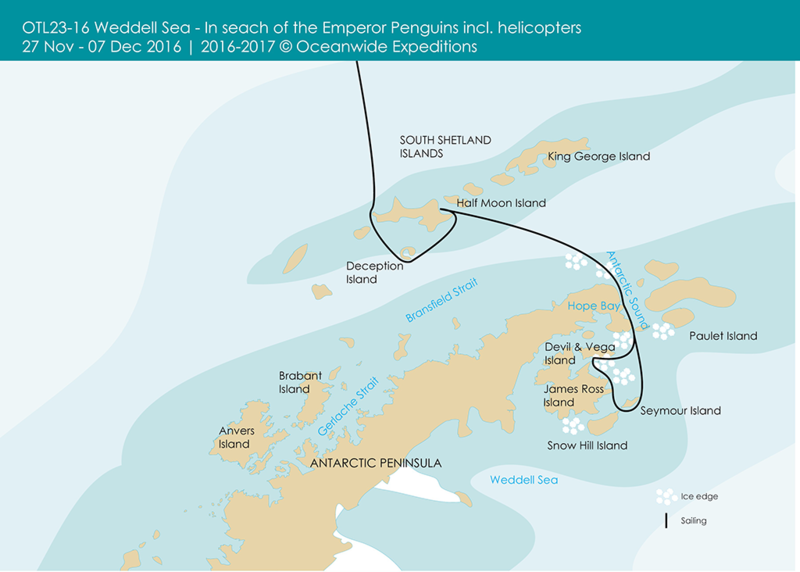 It also has a helideck that can accommodate helicopters for certain tours that are designed to find remote penguin colonies. The MV Plancius is a former Dutch Naval research Vessel (yes this time we do mean research) which has an ice strengthened hull. As you can imagine from the two naval origins of the ships, the Plancius is like a land cruiser. It is slightly more comfortable than the MV Ortelius, but it is not quite as tough. So Oceanwide use the two vessels in the best way possible. The Plancius does certain cruises and the Ortelius does the cruises where that slightly tougher hull is needed. 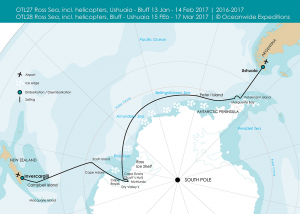 Having been on the Ortelius and having had the privilege of pushing south into the edge of the ice with her, we have absolute confidence in the Captains, crew and the organisation of Oceanwide expeditions. They are absolutely professional and dedicated to safety. The MV Honduis is coming to their fleet soon. It being built as this website goes to press specifically for Oceanwide expeditions. It will combine a top rated ice hull with even more comfort and a helideck. We use Oceanwide for many reasons, but one which you will notice is the small numbers of passengers on the vessel 116 to 124. 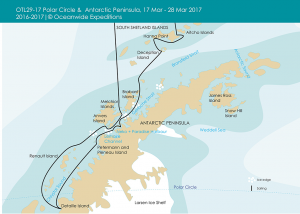 When you take into account Antarctic Kayakers and Antarctic Divers, and those wildlife photographers who want to do an Antarctic Zodiac cruise then you end up with less than 100 people, all of whom can land on the ice or the Antarctic peninsula. Under the Antarctic Tour operators policy only 100 passengers can land on the ice/Antarctic peninsula at any one landing. This means that there is no queue. Everyone who would like to, goes off the ship every day, at every landing/activity point. It is hard to overstate the importance of this. We saw large cruise ships in the Antarctic with lovely balconies, but the passengers of these ships only had “eyeball landings”. This means that of the 350 on board, only 100 could land at any one time. All of our Antarctic Cruises or Expeditions are as active as you want them to be. All of the landings have snow shoes where applicable and are fully guided by professional Antarctic Guides. 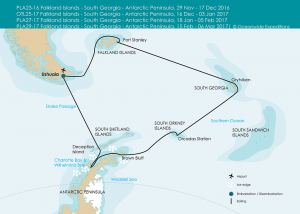 The best selling Antarctic Voyage is the 10 day Antarctic cruise that takes in the Antarctic Peninsula and the South Shetland islands. 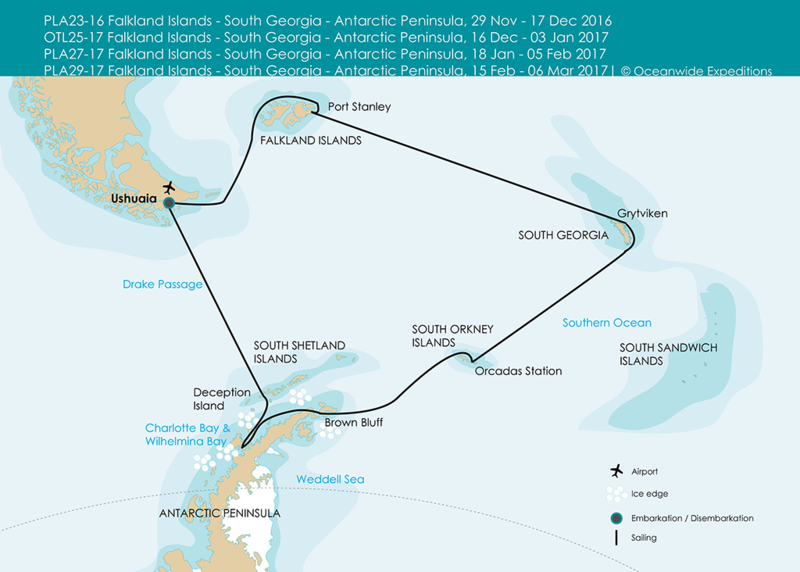 This cruise usually takes in the British Post Office at Port Lockroy, the British Antarctic Heritage trust sites at Port Lockroy and Damoy hut. 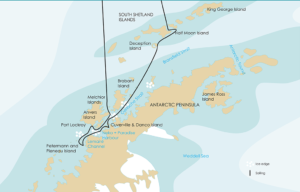 Sometimes the expedition may pass by the Argentine Antarctic Station at Brown Station and other locations based upon weather. Seeing the history of the Antarctic is an amazing experience. Seeing where the Royal Navy Set up bases to block German U boat traffic is a humbling experience. In addition, this tour takes in Necko Harbour and the deception Island. If you are very lucky, you may be able to transit the Lamaire Channel, which is possibly the most beautiful cruise in the southern hemisphere. 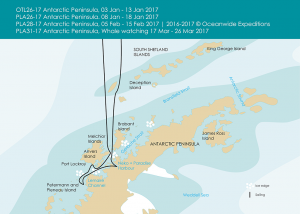 Without doubt the most exciting and fulfilling Antarctic Voyage is the one that takes in the Falkland Islands, South Georgia and the South Orkneys and the South Shetlands. South Georgia is actually more difficult to get to than the Antarctic Peninsula. Very few vessels call there, and yet these islands, the subject of the BBC’s Blue Planet, are perhaps the most unique breeding grounds for birds on earth. Protected by British legislation and fisheries protection infrastructure, the wildlife on South Georgia is immense and unique. 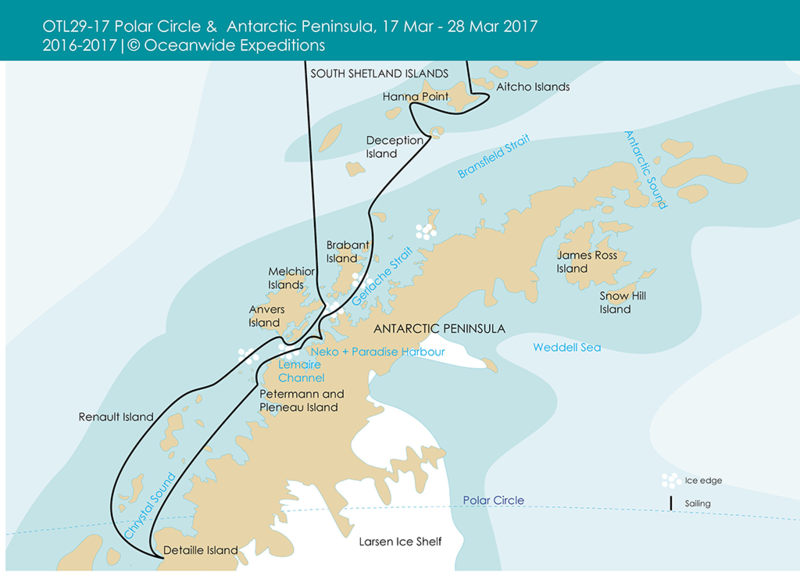 South Georgia is a jewel of any Antarctic Cruise. 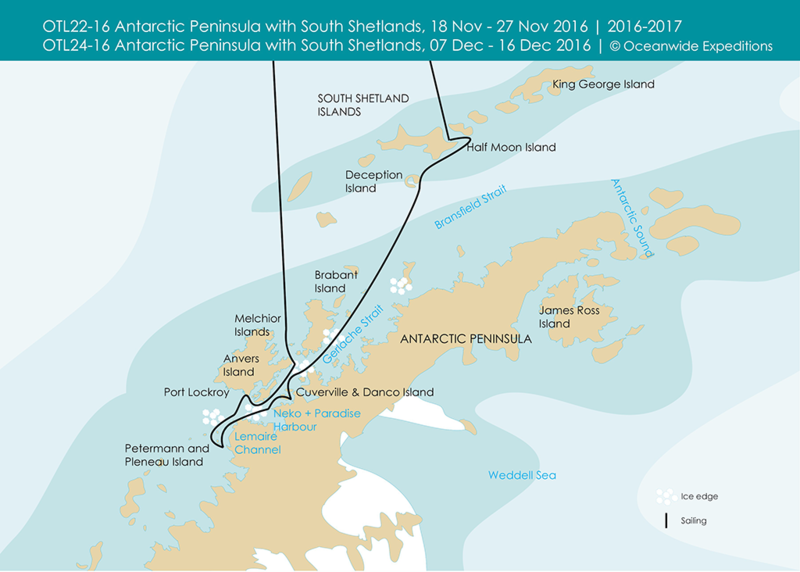 On all our Antarctic expeditions Non-divers will land daily on the Islands and the Antarctic Peninsula. On the specific dive expeditions, the divers will explore what is below the surface. On many occasions, divers will also have the opportunity to land and view first hand the stunning scenery and amazing life of this pristine part of our earth. Most active people will have the correct cold weather clothing for this voyage, but specialized boots (and snowshoes if needed) are provided by the boat for the land-based activities. December is warm for Antarctica, but even so you should be prepared as though you would be spending an entire day outside skiing or hill walking on a snowbound and cold Welsh hillside. You can expect to see many species of penguins, Leopard seals, Weddell seals, Antarctic Fur seals, dusky dolphins, albatrosses, skuas, snow petrels, and whales (orcas, minkes, and southern right whales are common). Benthic fauna includes nudibranchs, gigantic sea spiders and isopods, fish with antifreeze in their blood, anemones, brachiopods, crinoids, and many other animals unique to Antarctica. The last frontier of diving is the Antarctic. The dive numbers are limited to a maximum 32 or three zodiacs, in order to keep this expedition exclusive and easy to manage. You will need to show proof that you have done at least 30 dives in a dry suit. Cylinders and weights are included; all other equipment must be provided by you. (details upon request) . What you do not have, we can put you in touch with first-class suppliers. All trips booked through African and Oriental Ltd have 100% financial protection under the UK’s Package Travel Regulations 1992. Our ABTOT bonding protects your payments, no matter where you live. As per the oceanwide requirements, you will need to spend a night in Ushuaia. We strongly recommend 2 nights in case of any baggage issues. We are more than happy to tailor make your package with flights from Buenos Aires to Ushuaia, hotels and transfers in Buenos Aires and Ushuaia. We also offer diving and tours in Ushuaia and flights to Buenos Aires from your hometown if required. Simply contact us below and we will organize everything.